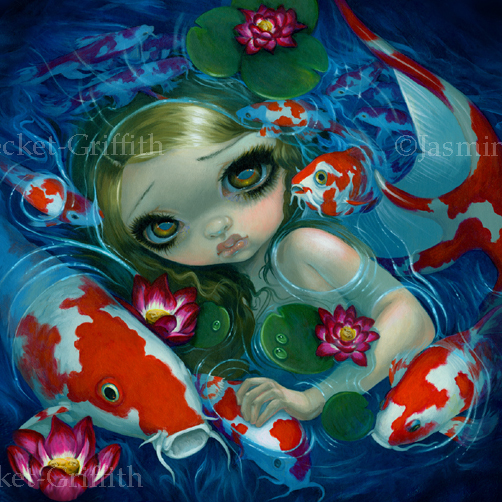 From my "Myths and Mermaids" solo show at Pop Gallery at Downtown Disney, here is "Swimming with Koi"! I enjoy painting bright coloured koi fish, they look so lovely against the clear blue waters. And of course - their mermaid friend is swimming alongside them - I'm not sure if the mermaid is tiny, or if the fish are just huge! Last I checked, the original painting is still available at Pop Gallery, and the Limited Edition Canvases are exclusive to Pop Gallery (and Hoypoloi Galleries). Other prints & merchandise are available online. Limited Edition Canvas prints are exclusive to Pop Gallery and the Hoypoloi Galleries. 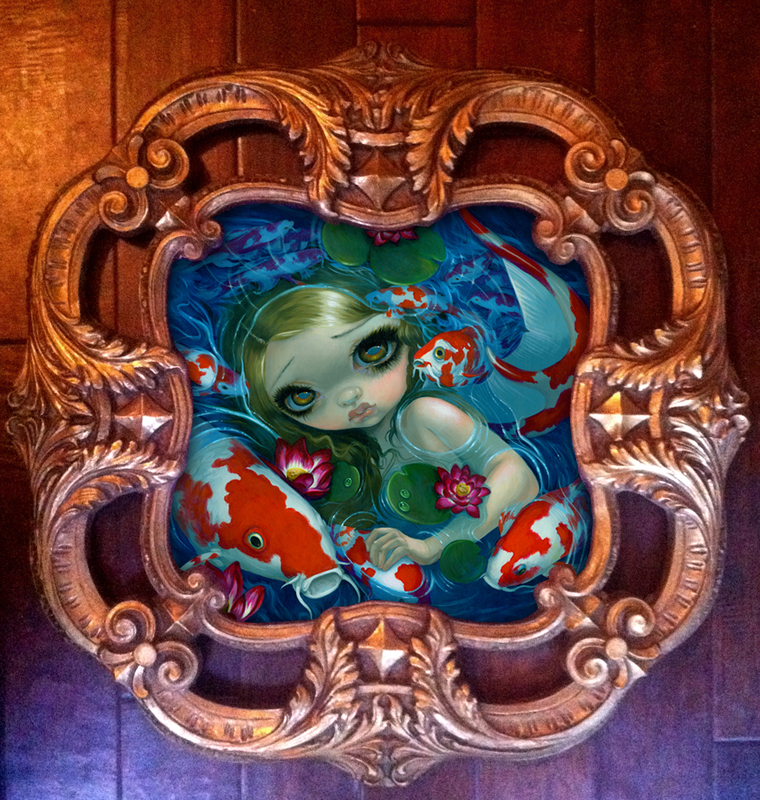 You can pick yours out in person, or they are happy to ship worldwide- just call them at 407-827-8200 or email them at popgallery@me.com - the "Swimming with Koi" Limited Edition Canvases are a big 20"x20" gallery size, deep cradled/gallery wrapped edges, hand embellished by me in acrylic paints, signed & numbered out of 42 ever made, and at $575 each they are truly the next best thing to owning the original. The ORIGINAL PAINTING comes framed as shown above (measuring 30x30" exterior) and is $6400, also available from Pop Gallery. 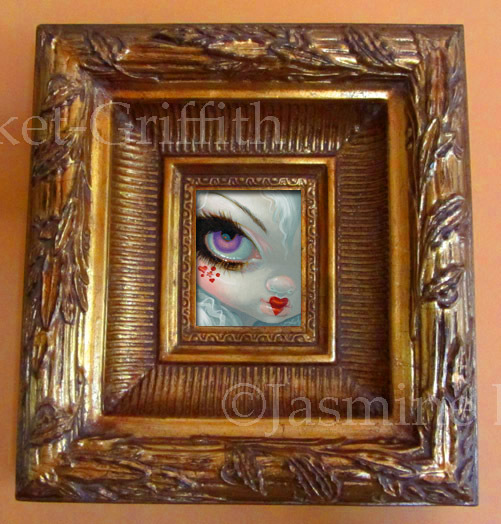 A tiny original acrylic painting on panel, framed in an ornate resin frame (exterior measurement 10.5"x10", interior measurement is 3.5"x2.5"). A sweet valentine's kiss! So everybody can have a chance, I have decided to auction this painting off starting at just one penny, with no reserve. Could just be the perfect Valentine's Day gift! The auction is on eBay here - starting at a penny, ending the evening of January 31st. My next live appearance will be as a guest at FaerieCon West in Seattle! My first time at FaerieCon West, I am looking forward to it. FaerieCon West will be held February 21-23 at the Doubletree by Hilton Seattle Airport, and I will be there with as much artwork I can bring with me! As I'll be flying, it will be a small-ish booth, but I'll be bringing small original paintings (including my show exclusive Tiny Treasures), canvas prints, mini prints, my Strangeling books, and will be debuting my new "Les Vampires" Oracle Deck! I will be there in person for all three days. My official FaerieCon West Event Page is HERE and FaerieCon's Official Website is HERE. Other great artists (including Amy Brown, Annie Stegg, Stephanie Pui-Mun Law, Justin Gerard, Linda Ravenscroft, Charles Vess & more!) will be there, great music, faerie masquerade balls and tons of other special guests & great shopping. See you there! 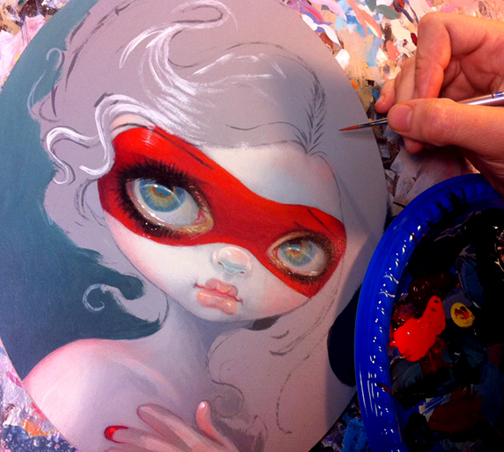 A work-in-progress of my latest painting "Red Mask." This is a very special painting, part of a group show called "Red" that will be debuting at the new Eight and Sand Gallery in Seattle's Georgetown area. The show will run from February 8th through March 9th (open Thu - Fri: 12:00 pm - 6:00 pm and Sat: 6:00 pm - 9:00 pm). While I'm not going to get the chance to be there in person, drop in & see her & the other great RED pieces. Details & maps to Eight and Sand can be found on theirFacebook page HERE. My "Red Mask" original painting is an acrylic painting on an 8x10" oval masonite panel and will come in a lovely silver oval frame. She will be priced at $2200 - if you are interested in the original painting, contact the curator Alex ateightandsand@gmail.com . While preference will be given to collectors visiting the gallery, Alex is accepting inquiries for the contact list on this particular original painting.